All things are connected, interconnected. Too often, human beings fail to see this truth, and so we live as if we were separate from each other, as if we were fundamentally different and disconnected from the non-human animals, and the environment that surrounds us. We are even disconnected from ourselves, from the wisdom of our hearts that knows that only by living in harmony with all life can we ever be truly balanced or healthy ourselves. Some of us become interested in becoming vegan because of the suffering of our farmed animals, or because as environmentalists we have understood and accepted the devastating impact of animal agriculture on the environment. Many become interested in a plant-based diet because of our own health and the realization that animal products are harmful while plant-foods are healthful. The truth is these issues are not separate. What is good for the animals is good for the planet is good for our own health. When we raise sentient emotional beings as if they were inanimate objects, cramming them into as small a space as possible in order to squeeze out the largest profit, the animals are not the only ones who suffer. Factory farms are responsible for producing toxic waste that contaminates our groundwater and drinking supply and are responsible for 37 percent of methane (CH4) emissions worldwide. Methane has more than 20 times the global warming potential of CO2. And modern nutrition science tells us that animal products are possibly the leading factor in what are known as the “diseases of affluence” those diseases like cancer, heart disease, and Alzheimer’s that personally touch all of our lives if we live in the developed world. Is it a coincidence that the diet that can prevent suffering of animals is the same diet that can reverse the process of global warming and keep us healthy into a ripe old age? 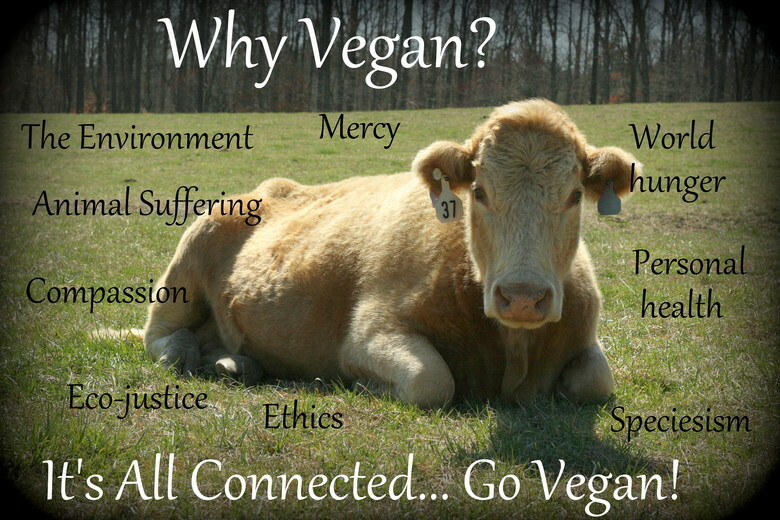 Maybe, but the simple fact is that eating a plant-based (vegan) diet is the wisest, most compassionate, and necessary response to all of these problems. For more information on specific issues, please click on the links below.